We began the 6 week build season by examining the game and assessing our skills to determine what type of robot to build. The first decision we faced was how to balance the robot functions of climbing vs. shooting. To be good at one task causes you to compromise with the other. We decided to build a robot that can shoot very well and climb just to the first level the pyramid. Next we needed to select a drive system. 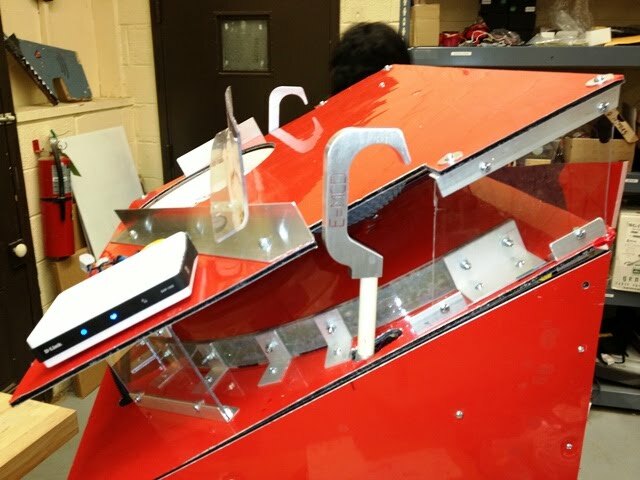 Last year we used a 6 wheel configuration and were one of the strongest robots on the field. For this year decided to change direction and build a 4 wheeled robot that will highly maneuverable. To achieve this end, we ordered a set of special wheels called mecanum wheels. These wheels, along with special programming, allow the robot move forward, backward and most importantly from side to side. 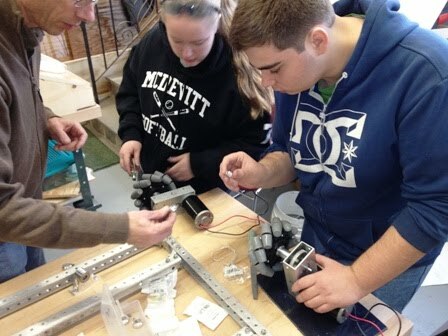 Here are Mike and Jess building the motor/gearbox/wheel assembly. Notice the odd shape of the mecanum wheels that allows the robot to move side to side. Our next decision was how to throw the Frisbee. We experimented with several different designs before settling on a spinning tire and a curved launcher. A piston, using air pressure, pushes the Frisbee into contact with spinning wheel. It is then propelled against a curved piece of thermoplastic with rubber attached and is launched at a very high speed. A video of the prototype is at bottom of this page. 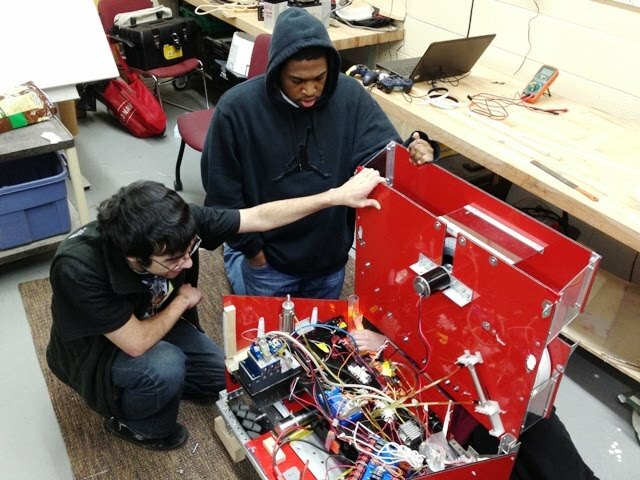 In this picture you can see Leno and Greg examining the inside of the robot. (Our robot opens up like a car hood to allow for easy maintenance.) You can see the motor that drives the wheel and the piston that pushed the Frisbees mounted on the underside of the “hood”. 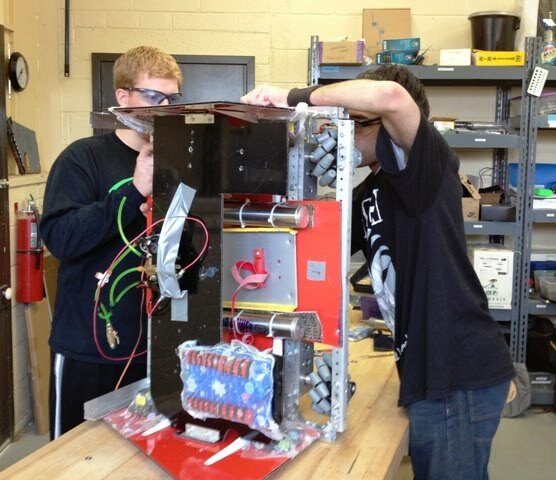 Our shooter is very powerful and we expect our robot to be one of the best at throwing Frisbees long distances. Here is the robot about 1/3 of the way completed. We will be able to earn 10 points by ‘climbing’ the first level of the pyramid. We don’t actually climb, we reach up with 2 hooks, grab the crossbar of the pyramid and lift ourselves off the ground. Notice the nice hooks we use to grab the crossbar of the pyramid. The were machined for us by McDevitt alum Bill Liembach and are etched with our team name, E=mCD. Bill was a tremendous help to us, he also machined some axle mounting brackets and some wheel bearings for us. Without these precision parts, our robot would not run as smoothly as it does or be as reliable as it is. Here is a video of our robot going through final testing. You can see it move sideways on the mecanum wheels as it gets ready to perform the hang. We begin the competition on March 2nd and 3rd at Hatboro-Horsham High School. Here is a video demonstrating the challenge for this year. Here are some videos of our finished frisbee launcher assembly in action.